I have added a graphical depiction concerning Inflight Rest to the Concept Model, as well as the Module 2 of the presentation. NAA questions to the EASA regarding the new FTL. At a meeting in Cologne in Feb 2014 several requests for clarification were made to the EASA. EASA Presentation Material from 15-16-May-2014 Workshop. The attached material is from the 15-16-May-2014 Workshop. 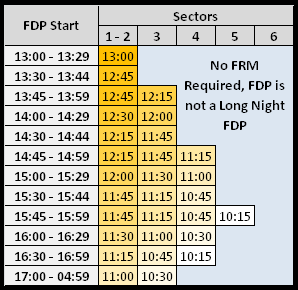 Consecutive night duties, the number of sectors is limited to 4 sectors per duty. To aid in understanding the requirement to apply FRM to Long Night Duties, the following Table has been developed for acclimated / Un-Augmented CM’s. Asking the EASA questions – we all win. I recently received information from the EASA that the following definition was missing from the final version o fthe EASA FTL effective 2016. ‘Eastward-Westward and Westward-Eastward transition’ means the transition at home base between a rotation crossing 6 or more time zones in one direction and a rotation crossing 4 or more time zones in the opposite direction. While it may seem to be a small thing, asking questions is how we all ensure that the regulations will in the end be implemented correctly, effeciently and most importantly safely with the least amount of confusion. I wish to thank the EASA for taking the time to answer my simple question. I am sure the various NAA’s, Airlines, Unions, Crew members and Vendors all have questions, just ask, my answer came in a timely manner, was direct and too the point.